Funky Chickens follows Zephaniah's popular collection, Talking Turkeys, and uses the same inventive design format, making this a very attractive companion volume. The book is certainly funky with raps, hip-hop, epics, rhymes and word play of multifarious kinds. Zephaniah's enjoyment of words is evident and although his work is very oral, he includes a number of poems which look at poetry and writing from many different perspectives. Another favourite topic is the Queen Dis ting is serious/Do it for all of us/Save our asparagus/God save/Our/Green. There are also serious moments in Zephaniah's poetry and he is not afraid to expose the sensitive side of himself or to make a point about racism: Sometimes it's hard/To get a taxi/When you're Black (from 'Walking Black Home'). The overall design is kind and lively with Zephaniah's face smiling out at the reader in various guises; in a funny poem, we see him right in the middle of a baby's rattle; in a poem about computers, his image gets distorted into weird and wonderful shapes. 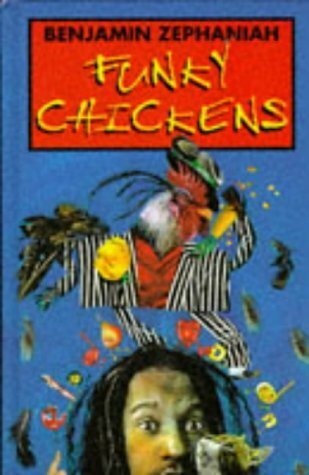 Thoughtful, tender, humane and humorous, Funky Chickens strut their stuff throughout the pages of this inviting book.